Winner of "Best of Amarillo 2018" - We Thank You Amarillo! | Gary's Heating and Air Conditioning Inc.
Wow! At Gary’s Heating and Air Conditioning, Inc., we work hard for our clients, which is why it is such a great honor to be voted “Best of Amarillo” by Amarillo Globe-News. We love Amarillo and wouldn’t want to live anywhere else. The mission of Gary’s is the same today as it was in 1978 when this business began: To provide a great value on home comfort for our Amarillo clients with 100% satisfaction. 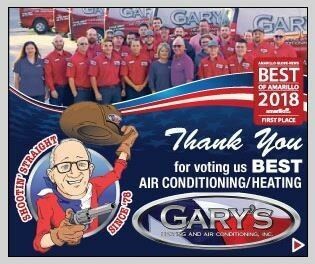 We sincerely want to thank all of our GREAT and valuable employees and our loyal clients who took the time to vote for Gary’s. We are honored and blessed that you put your home comfort needs and home safety needs in our hands. Just as a reminder to all our Amarillo area customers: We offer repair, replacement, maintenance plans, ductwork cleaning, and replacement and insulation! We work on ALL brands of central HVAC equipment! Our highly trained and skilled technicians and installers are always ready for a challenge!